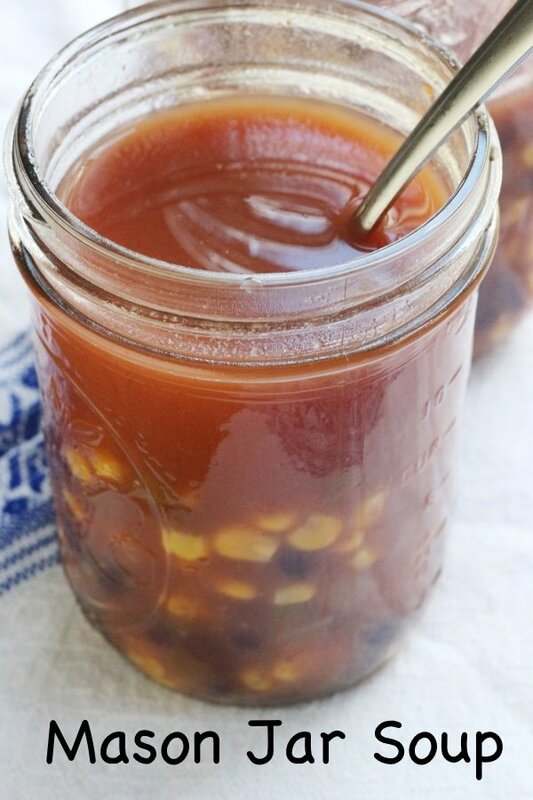 Mason jar soup is the soup you want for the start of fall. It is easy, portable, and people will be jealous of your ingenuity. Mason jars are absolutely everywhere!! For my birthday, I went to a fancier than usual place for brunch and they were strung from the ceiling with light bulbs in them. I know it doesn’t sound fancy but I guess it has become very stylish to hang them around. But, who wants to hang them up when you can use them for delicious soup? The concept is simple – make some soup, store it in Mason jars – heat up in bowl in microwave (or on stove) when ready to consume. If you are going to work or school, add the step of tossing the Mason jar into a lunch bag. Where can you find Mason jars? You can buy them in packs of 12 at a hardware store. They are great for storing change, pencils, dried beans, or whatever you have that needs to be dry and fresh. I just used mine for easy refrigerator pickles. I can fit even the large quart jars in my dishwasher. This recipe involves no cooking! 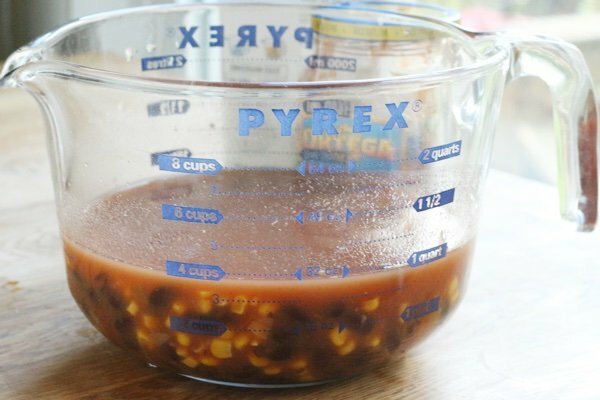 I mix the ingredients in a large measuring cup to make it easy to pour into the jars. 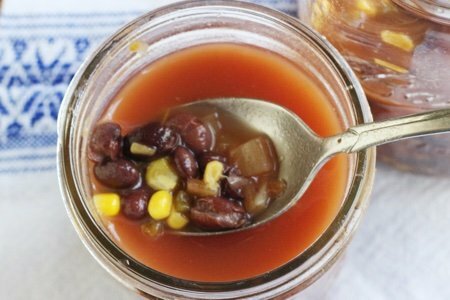 I love my vegetarian black bean soup recipe but this mason jar soup is perfect for when I don’t have time to cook. For those who are worried sugar added in your salsa – don’t be concerned. Most brands (including this nationwide Ortega) do not add sugar. I don’t think salsa needs sugar but I also think that about tomato sauce (and there can be quite a lot added). I like to use medium strength because I like my food spicy but you can choose whatever salsa you like to make this work for you. For those Weight Watchers members out there – this soup is ZERO points. Just don’t add sour cream, cheddar, tortilla chips, or anything else high in calories and you don’t have to count it. Do you store food in Mason jars? What do you make? 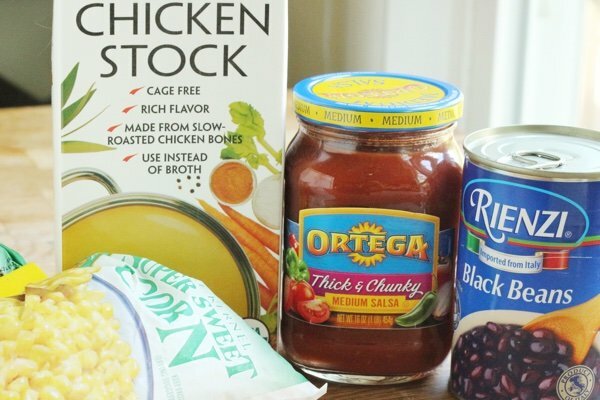 Combine the black beans, broth, salsa, and corn in a medium bowl or a large measuring cup. Spoon into pint jars and store in the refrigerator until ready to eat. To serve, pour into bowl or pan and heat until hot. Add tortilla chips, lime juice, cheese as a garnish. This sounds good. But for those of us who choose to go low-carb, we would need those vegetables, and perhaps a bit of meat - all of which would be pre-cooked, in order to reheat later. Thank you for all your recipes. this sounds delish! years ago I had no glass container to store leftovers, so I started using jars. the jars were great to heat up the leftovers. Thank you for posting this! My husband and I have lunch crocks and this would also be a great option to throw together and reheat in our crocks! And there are so many variations and options that are already popping in my head! @Robyn - one serving is one jar. Great question!! So nice to see your favorite student dish! Very tasty soup, I advise everyone. Cost-of-sale products are cheap and suffice for 2-3 doses. I remember when there were “hot” days at the university I was engaged in my math solve https://domymathhomework.org/, then this soup was real food for the mind. Even now, when I live in an apartment, I sometimes cook it myself to remember the student years. Give me back that time ..